I do love reading about the things that people pick up in their lunch breaks, so hope mine is somewhat interesting too! This wasn’t a lunch break… more of a ‘coffee’ break with the lovely Ally. Since getting my Clarisonic, I’ve turned into a bit of a cleansing freak and there’s nothing I like more now than experimenting with all manner of different cleansers in conjunction with the gadget! Honestly? I don’t know how I didn’t get the crap beaten out of me at school. Not only that, but despite having found a total JOY in the new Elemis Melting Cleanser, I *still* can’t resist picking up these ‘just incase’. This is my problem though… by the time I’ve finished experimenting to see if I can find a cheaper alternative, I will have spent what it costs to go and by the Elemis twice over! Please tell me I’m not alone in that kind of nonsense! So after that rambling… what did I get? Well, there’s currently a rather tempting 3for2 across skincare lines in Boots at the moment so that’s where I indulged! I picked up the Boots Botanics Organic Cleansing Balm (£6.63) after reading the on-site reviews. I also grabbed a nifty looking Boots Botanics Organic Nourishing Eye Makeup Remover (£3.99) (US link – I can’t find it on the UK site!) and the much revered Vichy Dermablend Corrective Foundation in Opal (£14.30) which I’m hoping to use as a redness concealer. One last stop near the haircare and I grabbed the new Batiste dry shampoo for brown hair. I’m not sure if this is reformulated or just repackaged from this one. I’m secretly hoping this can will get me through those days where it takes you longer than it should to realise that you seriously should go buy some more hair dye. Like now. I’m in London today and I’ll be doing my best to avoid ‘popping’ into Boots for another look before the offer ends. Honest! What have you been hauling recently? Yaaay, haulage! Lately, I love cleansing balms! *hem hem* what ELSE did you get yesterday ladyface? I do believe you got something to do a FOTD with. MWAHAHAHAHA. I’m off to get dermobraised tonight, it’s been nice knowing you…. I bought the blonde Batiste the other day and I really don’t like it – maybe I had too high hopes for it though! Gotta love Batiste! I love mini lunch hauls… thank god for brands like Collection2000 etc for saving my wallet a bit! I didn’t know Boots stock Vichy products! Vichy is really expensive in Malta but I love their 3-in-1 cleanser! It’s amazing & totally removes all of my eye make up!! My 3 for 2 haul was all Neutrogena Multi Repair Crean which is good on scaly shins and cold chapped hands. I usually enjoy a potter around Boots but have been surprised at the state of the two big stores I visit. I have seen empty shelves, disorganised stock, swimwear half hanging of its hangers. It doesn’t look good. I love dry shampoo, but for some reason I’ve never even considered giving the coloured one a try. *Facepalm* Will go scope that out. The Vichy Dermablend stuff is freaking phenomenal. It even hides tattoos! Nope, you’re not alone. I do that with mascara all the time. My favourites, without a doubt, are all from Lancome but I cannot help but try new drug store ones just in case they’re as good. By which time, I’ve as much, if not more than the £20ish that it would have cost to pick up a Lancome one but the money’s gone so I’m stuck with the crap ones. It seems I’ll never learn either. I’m totally going to check out the eye make up remover, that looks really interesting. My next mini Boots spree is going to include the No. 7 Precision Brow pencil with the £5 voucher I got at the weekend. My last haul was in Manchester on Saturday, the 3 for 2 on Bourjois – I couldn’t resist the little round blusher pot in Coup de Foudre, and before I knew it I’d also got the Ombre Stretch in Taupe Modulable (it’s more of a plum/fig) and a blacky-green little round pot too. 3 for 2s are a killer for me! I never buy enough in one go to do haul posts but I love reading them too. I’m always try to find that one cheapo skincare product which I will love as much as my more expensive brands. I’ve yet to find that HG and it’s pretty much money down the drain. Yet I still live in perpetual hope. I’ve been hauling some Lancome goodies recently that I really should post about before the photos rot on my camera! 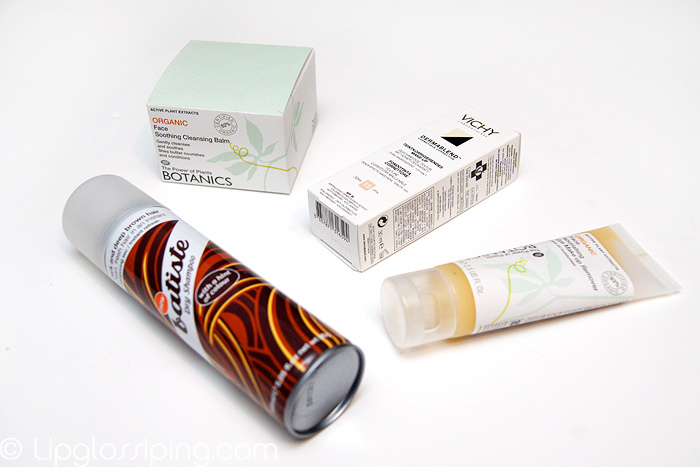 Just curious how Boots Botanics stuff turns out to be, looking forward to reviews!